This lightened up, healthier version of the popular summer creamy pasta salad is perfect for the upcoming grilling season, Easter lunches and potlucks. It packs well for picnics and lunches and can be made ahead of time and brought out for the big event. In a strange twist, we ended up enjoying this creamy pasta salad as our main dish on Easter Sunday this year. We had friends over for what was supposed to be a super casual dinner on Saturday night…but ended up becoming a bit of a party. We all slept late on Sunday (turns out that dancing until 10pm will actually make my kids sleep past 5.30 in the morning…about the only thing! ), and when we woke on Sunday, everyone was super relaxed. Subsequently, the thought of spending the day in the kitchen cooking up a big ham was not enticing at all and we decided on a picnic instead. It was actually really lovely, and we enjoyed it so much that I think we will definitely be incorporating more of these little jaunts into our spring and summer weekends. Every time I ask my husband what he wants to bring for a picnic, his first response is always creamy pasta salad. You know the type, the rich and creamy pasta glug/goodness that comes prepackaged in huge containers at Costco. It is the ULTIMATE picnic food, and I used to be quite partial to it as well. I stopped buying it years ago though, so poor hubby always makes a bee-line for the big bowls of creamy pasta salad that you know will be at pretty much every BBQ over the spring and summer season. I finally decided to have a go at making him a homemade version. I wanted to make it taste as close to the store-bought version as possible, because otherwise what’s the point, right? It worked out way better than I could have expected, and this will definitely be my go-to creamy pasta salad recipe for the entertaining months to come. and of course some Homemade Watermelon Lemonade. 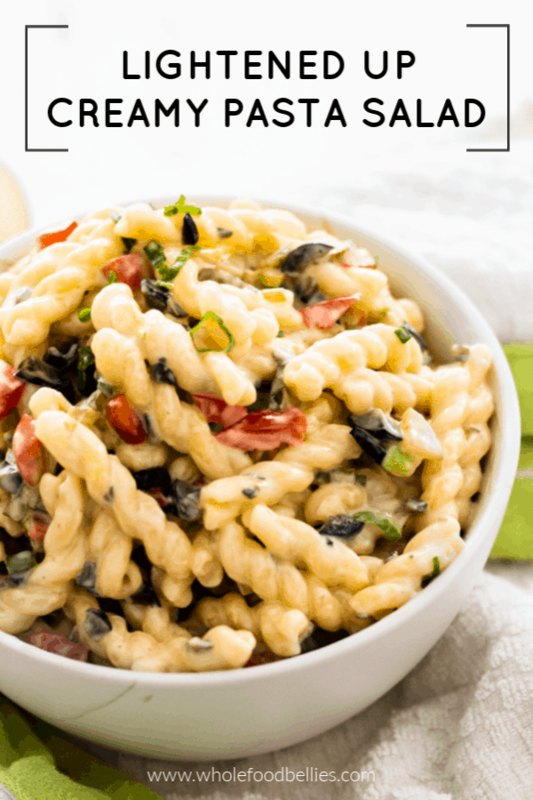 This lightened up, healthier version on the popular summer creamy pasta salad is perfect for the upcoming grilling season and summer potlucks. 1/3 oz can black olives finely chopped, 6 . Make sure you allow to cool before serving, or it won't be creamy enough. Great way to get some yummy, crunchy veggies in everyone! I love a good pasta salad! The addition of dill pickles here is so fun! Dancing at a casual dinner party at home, yay! I love it when that happens. 🙂 Creamy pasta salad with veggies sounds like a wonderful Easter meal. This looks delicious. Me too 🙂 It’s definitely not a traditional Easter meal, but it worked for us! Homemade is the way to go, and looks like you’ve proved it! This salad looks really creamy and delicious! Isn’t it fun, too, to come up with new holiday traditions (whether by accident or not)! Homemade is definitely the way to go 🙂 Yes I am loving coming up (accidentally or otherwise) with new traditions for our little family!! Creamy pasta salad is totally the best! I am LOVING all the pickles/pickle juice in here. YUM! Oh I am totally obsessed with pickles!! Homemade is always better than store bought. Love this salad for summer! This looks SO creamy and delicious! I never would have thought of using yoghurt, I might have to try this with soy yoghurt. Love a great easy (and creamy) pasta dish! Love the idea of a lighter version of this classic pasta salad! i prefer to make my own salad too. So mush fresher and we can use the ingredients we know and enjoy! Thanks Deb! 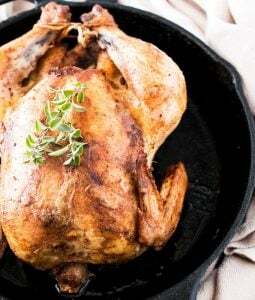 Definitely on board the homemade train, especially when it comes to freshness – who knows how long that store bought stuff has been sitting there?